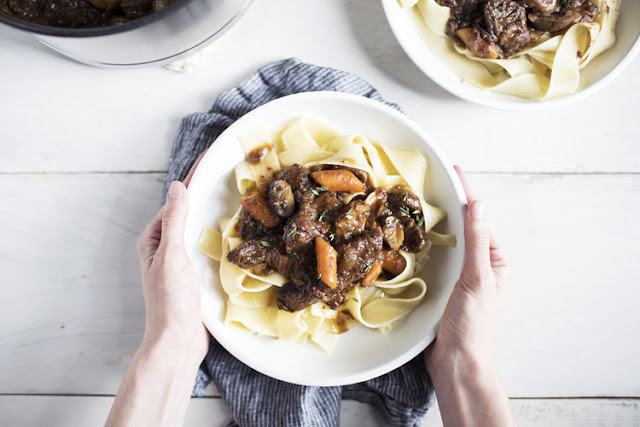 Our Nest in the City: Slow Cooker Boeuf Bourguignon + Slow Cooker or Instapot? Slow Cooker Boeuf Bourguignon + Slow Cooker or Instapot? I'll be honest, I struggle with the colder months. I have such a hard time staying warm, no matter how many layers I put on, so to compensate I drink hot tea all.day.long and only cook warm meals (read: I'm not a big salad eater in the winter!). With this comes slow cooker meals at least a couple of times each week, because stews and soups are the best part of winter cooking. I've been thinking about asking for an Instant Pot for my birthday. It was on my list last Christmas but didn't work out as they were sold out everywhere after Black Friday sales. I do love my slow cooker so much and can't find much fault in it, though the thought of making pulled pork in an hour instead of eight is definitely appealing! I don't mind the slowness of the slow cooker most days because it's often a meal I put together before church on a Sunday morning that's ready when we get home at three o'clock. The hours are certainly longer than an Instant Pot, but it's all hands off time anyway, so who cares? Right now I feel like it's basically the same as my slow cooker but faster. Tell me how much faster and better it is, ok? I believe it also uses less energy/power which is interesting. And what's your favourite thing to make in the Instant Pot or the slow cooker? For now I'm happy with my slow cooker and last night I made an amazing Boeuf Bourguignon in it. I was inspired by one of my favourite food blogs, Modest Marce, but hers was a stove top version and I wanted to cook mine in a more hands off way so I used my slow cooker. I also tend to find that stove top stewed meat never ends up soft enough for me (read: chewy and sometimes hard instead), but slow cooking never fails me. Start by drying your cubes of meat in paper towel, then sear them on very high heat in a little bit of olive oil, on every side if possible. This should be done quickly, maybe 5 minutes max. Then set in your slow cooker. In the remaining bacon grease, cook your onions, carrots, and garlic for a couple of minutes. Season with salt and pepper, and add to slow cooker. To your slow cooker add the wine, broth, tomato paste, and thyme. Cook your mushrooms on high heat, browning the outside and seasoning with generous pepper. Add then to the slow cooker for the last hour of cooking. At six hours, check thickness of your stew. If it's still too watery, add a few tablespoons of corn starch. Taste and season accordingly. Serve over pappardelle, my favourite noodle! This recipe makes a lot - probably 8-10 portions. Brad and I both ate large portions and there are probably 6 or so left, but we could have added a salad and baguette and eaten smaller portions. This is a great meal for a crowd or to put in the slow cooker before leaving for church on a Sunday morning (or any other outing). Alright Instantpot lovers, convince me! 1) it's a lot faster (though hardly instant, I have never managed anything in there that took less than 30 minutes what with it coming up to pressure and then down from pressure... But still! It doesn't require the planning ahead that a slow cooker does. 2) pressure cooked things just taste different to me than slow cooked things. We eat a lot of beans and they are just better tasting and more pleasingly textured in the instant pot. So is the meat that I do in there. 3) You can saute in right in the instant pot and then pressure cook your sauteed meats, etc. I know that there are slow cookers that can do this, but mine doesn't. 4) it can also function as a slow cooker. And rice cooker. And yogurt maker. So that's handy. In my opinion, it's good at all of those things as well. 5) it has a delay start and automatically switches over to keep warm. This is very helpful. That said, the biggest issue I've had with the thing is misleading recipe times. Recipe writers seem to ignore the time the pot takes to get to pressure and release pressure. That's annoying. Also, some people are overly optimistic about what you can cook in there. Yes, you can roast a whole chicken, but it's not very good. Unless you like a whole chicken in the slow cooker, in which case you would probably like that as well. In my opinion, some things just do better with dry heat, which the IP cannot do.